Lead by AP science teacher, Nancy Bridge, these students measured the amount of NPK (nitrogen, phosphorus, and potassium) present in five different soil types. Did you know they could do that? When I want to know the levels of NPK, I send soil samples to the soil scientist at the university. 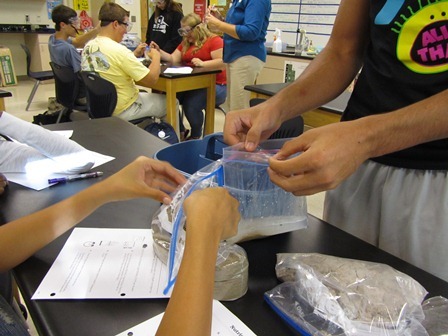 Skip the university – in Mrs. Bridge’s class, the students get to do it themselves. How cool is that? To begin, Mrs. Bridge showed her students the five different types of soils she had collected. As you know, teachers are very resourceful. Near Mrs. Bridge’s home, she spotted a new home construction site. 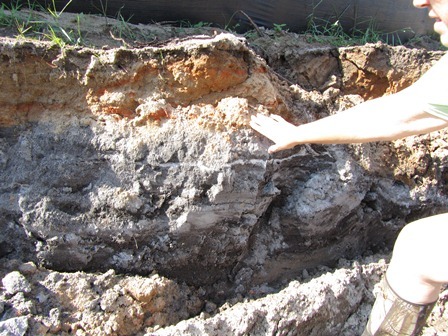 In the excavating process, the soil profile was exposed. Check out this picture. She got five different soil samples from the excavated spot for her eight lab teams. 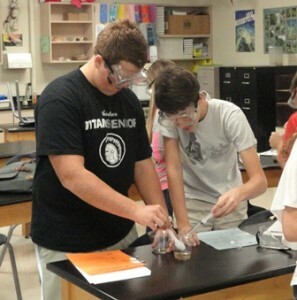 Following detailed instructions, each team extracted liquid from the soil samples. They then tested their liquids with a soil testing kit to see how much NPK was present in their soils. Elements like nitrogen, phosphorus, and potassium are found naturally in the soil. The students learned that farmers test their soils to determine if some of the elements are lacking. If they are, their crops cannot grow as they should. That is when farmers apply crop nutrients, in the form of fertilizer, to increase the yield and quality of their crops. I think AP science looks fun! I hope my daughters’ science teacher is as talented and resourceful as Mrs. Bridge!